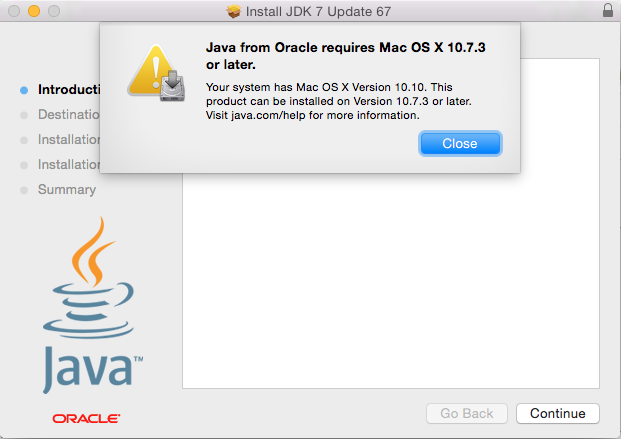 Java from Oracle requires Mac OS X 10.7.3 or later. Your system has Mac OS X 10.10. This product can be installed on version 10.7.3 or later. Visit java.com/help for more information. The following is a screen shot of the message as displayed by the installer. This particular issue has been assigned defect JDK-8046004 and affects releases of the Java 7 Update 67 SDK and earlier. This is also a problem documented in defect JDK-8027686 with the releases of the Java 8 SDK before Update 20. At present, there is no version of the Java 7 SDK that addresses this problem; however, the fix has been incorporated into the forthcoming Update 71. The fix has been included in Update 20 or later of the Java 8 SDK. The work-around described below will allow you to trick the installer into thinking you are running Mac OS X Mavericks by modifying the SystemVersion.plist configuration file located in the /System/Library/CoreServices folder. After you complete the installation, you will restore the SystemVersion.plist configuration file to its original state. Open the "Terminal" application on your Mac. Perform a normal installation of the Java 7 SDK. After the SDK is installed, return to the terminal window and run the following command to restore the SystemVersion.plist file to its original state. Information from the following sources was used in the course of composing this article. "Error trying to installing JDK8 U11 OS X 10.10 Yosemite"
"Fail to install on MacOS 10.10"
"Unable to install OS X 10.10 Yosemite. OS X 10.7.3 or later requirement error."